Enjoy sunshine 365 days of the year. This daylight table lamp will reduce eyestrain and increase your sense of well-being on gloomy days! 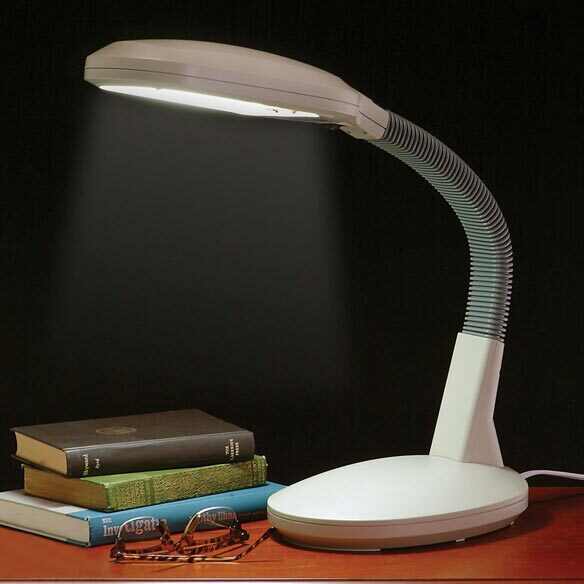 Stimulating natural daylight, sunlight desk lamp gives full-spectrum, glare free light that's great for reading, writing, or crafts. Sun lamp includes a 27-watt bulb equivalent to a 150-watt bulb, but it lasts five times longer (saves money too!). UL(R) Listed. Plastic. 9" wide x 25 1/8" high. excellent product at a great price would buy it again love it looks nice on my table I use it any time it have a soft glow. Use it at my desk. I have this set up so it shines over my shoulder onto my desk and laptop. Works great. Shines brightly so I can see and it doesn't throw off too much heat like some other lamps I have used. I think I'll get a second one for on my sewing table. I like this lamp so much that I ordered one for my daughter. Works well while doing art work at night. Wonderful bright light for any purpose in the house. I have one on my piano and another on my desk by my computer. I have already one and like it so much I am getting another one for the other desk. The light it gives out is so nice. I have not found anything comparable. 2 questions: first, is the "neck" adjustable; second, is the bulb that it uses sold in most stores? BEST ANSWER: Thank you for your question. Yes the map is adjustable and you can use a standard 27 watt bulb in the lamp. We hope this information will be of help to you. OK, got it - please no more responses, I'm not purchasing it. The neck is adjustable and I have not checked to see where the light bulb is sold since I have not needed to purchase one.